The central challenge of selling advertising in 2017 is the difficulty of getting appointments. Customers and prospects have more choices of where to allocate their budgets than ever. And major advertisers continue their 20-year trend of cutting fees or staffing that cover planning and analysis functions. Prospects have less time than ever to devote to examining new options or even staying up-to-date on media they have recently used. Advertisers mostly buy the safe and the familiar. Time engaged with buyers at any level, from senior executives to junior media planners or media buyers is precious. Capturing that time to sell is job-one for ad sales executives. “Challenger Selling” is simply the re-booted and re-packaged Structured Selling process that made Ziff-Davis famous. By presenting a “challenge” that a customer is facing, like losing market-shoe or missing sales, and then providing important information about that challenge, a sales person can better capture the attention of any prospect to engage them in a sales conversation that leads from the challenge — their needs — to the solution they are selling. Even before the “Challenger Selling” research, the challenger sales process was the approach that we have been teaching at ambro.com for 20 years. We learned it at Ziff-Davis in the 1980’s. 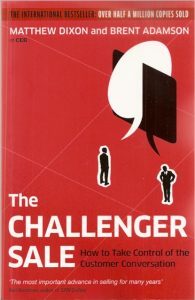 We used to say “sell the need to sell the solution.” Now, quoting “Challenger Selling,” we can say that statistically valid research results from study of many sales people selling complex products and services tells us that sales people who challenge their prospective client with perspective and information on the prospect’s situation — needs — will win more attention and win more business. 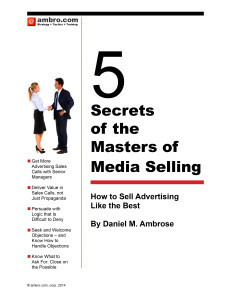 Challenging the prospect is what the very best ad sales people – the masters of media selling — do. Learn more about the 5 Secrets of the Masters of Media Selling and how to make cold-calls into smart-calls.